Actions: This fragrance free cream is amazing! It calms the skin by regulating the factors that cause sensitivities. A new generation of calming skin care that actually acts on the threshold of delicate, extra sensitive skin, to make it more tolerant and less easily irritated. Strengthens the skin's defenses, gradually decreases skin sensitivity and increases the tolerance threshold. Impressive! Calms the skin by regulating the factors that cause inflammation. Helps to slow down premature aging factors. Formulated with Cellular Water which helps to optimize the cells energetic environment. Provides comfort and relief to sensitive, easily irritated skin in a velvety, creamy and delicate texture. Results: Skin is calmed, relieved and rested. Flushing, burning, stinging and redness are minimized. Or just sensitive skin is truly treated! Indications: Skins which are fragile and in need of support. Prone to redness and sensitivity. Instructions for use: Apply morning and/or evening to clean, dry face and neck. May be used alone or after Cellular Concentrate Fundamental Serum for the BEST results! Makes a wonderful make-up base. Rub in using gently strokes. Suggestion- may want to use Calming Cream in the AM and alternate in the PM with another of Esthederm's nourishing creams to really feed those tissues! 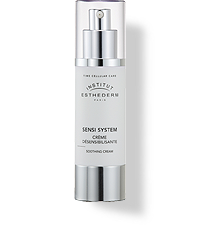 For even more sensitive skins we suggest Intensif E2 Cream and Serum!